Stay tuned for an Alex Oxlade-Chamberlain song coming to an Anfield terrace near you. Liverpool fans have been in top form yet again in the chants department, this time paying tribute to the club’s £40million deadline-day signing. After a tough start to life on Merseyside, the former Arsenal man is seemingly beginning to find his feet under the guidance of Jurgen Klopp. Reds have demonstrated their appreciation for the midfielder in superb fashion, producing a song that even includes a mention of the 24-year-old’s Little Mix star girlfriend Perrie Edwards. 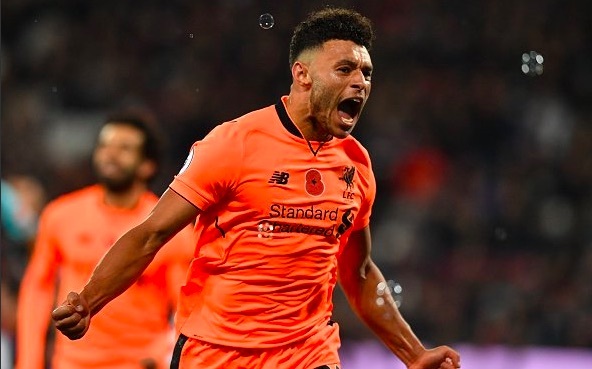 Oxlade-Chamberlain scored his first league goal for the club on Saturday as the Reds cruised to a 4-1 win over West Ham at the London Stadium. He added Liverpool’s third in the first attack straight from kick-off after West Ham had pulled a goal back early in the second half. It was arguably his strongest performance since signing for the club as he thrived alongside a reunited attacking trio of Sadio Mane, Roberto Firmino and Mohamed Salah. His inclusion added new depth to Liverpool’s attacking interchanging, with his work as a counterattacking threat and production in midfield allowing Firmino to drift deeper at times and Salah to occupy a more central role. Things are beginning to look up for the Englishman.